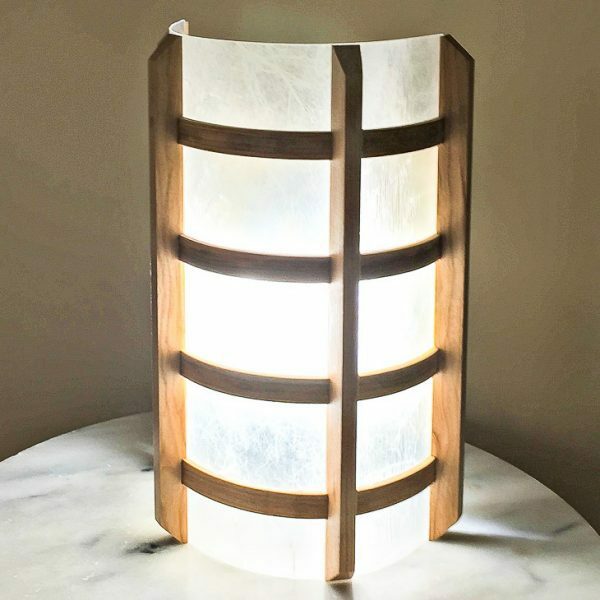 Get the look of a delicate Japanese lantern without the hefty price tag! 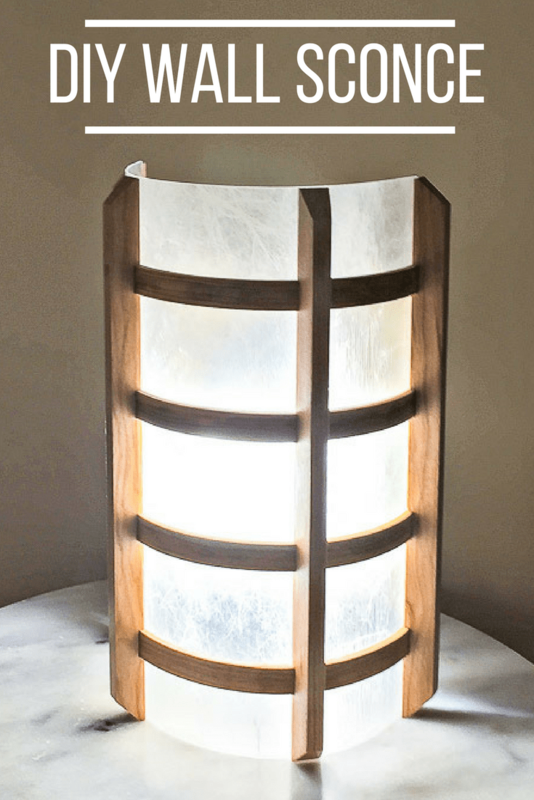 This DIY wall sconce will brighten up your home with a modern take on the traditional rice paper covered lantern. Whenever I visit my dad, I ask him to teach me more about the tools in his workshop. This Japanese-style DIY wall sconce was the perfect project to show me how to bend wood, cut notches on the table saw, and create perfect inside corners with chisels. I learned a lot, and he made a new light fixture for their home! 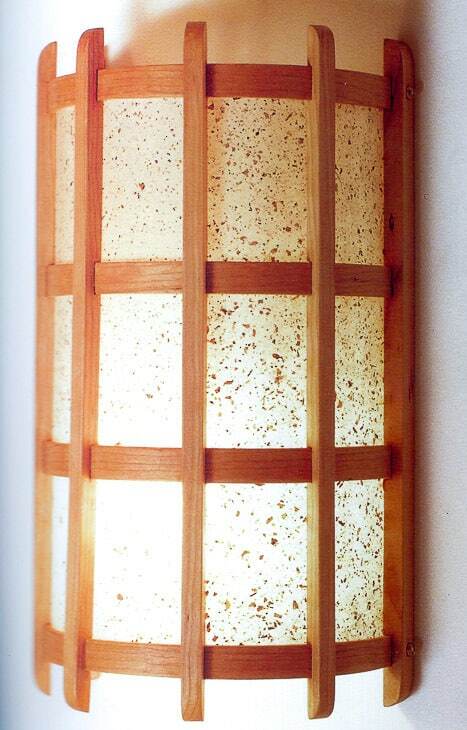 The inspiration for this DIY wall sconce came from this beautiful book of Japanese-style lamps and lanterns. He created the curved pieces before I arrived. 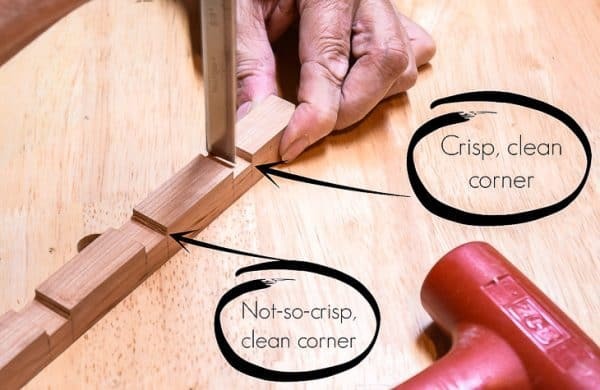 The process involved submerging thin pieces of cherry wood in water in the oven just below boiling for about 20 minutes. Then the wood was placed in a bending jig he created out of pipe hanging strap bolted to steel bars. 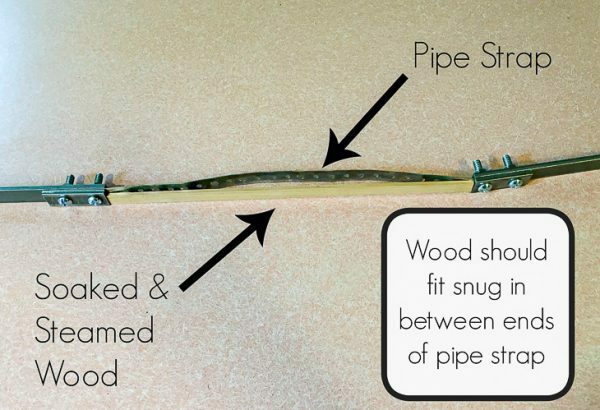 With the wood still soft and pliable, he was able to wrap it around the form (a large diameter PVC pipe). It was clamped into place and left overnight. 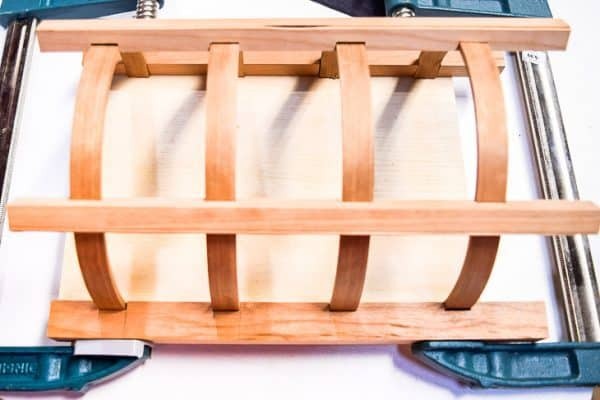 The strap keeps the wood from splintering under pressure and the holes allow moisture to evaporate out of the wood. 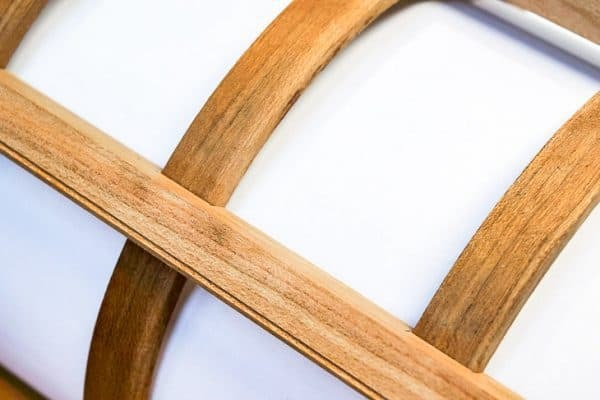 In the final version, the wood was left on the form for a full week to create perfectly identical curves that kept their shape. Parchment paper was sandwiched between the wood and the metal strap to avoid discoloration. 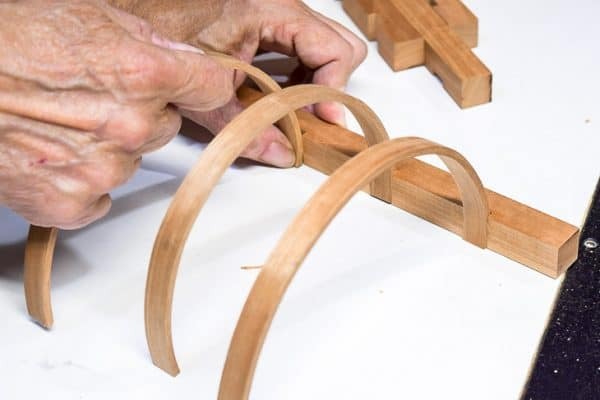 With the curved pieces created, the next step was to notch out the vertical pieces that hold the curves in place. 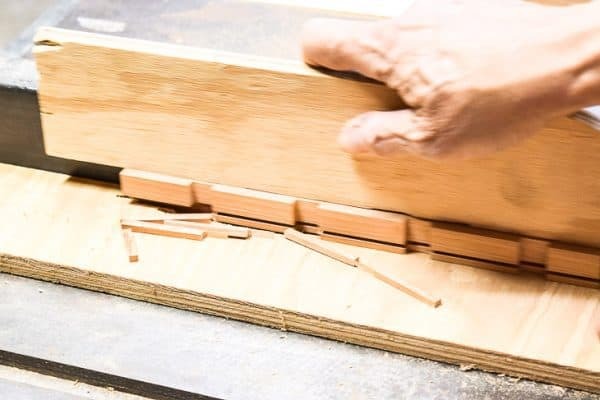 He lined up all four pieces on his table saw sled, checking to make sure the ends were square. Cutting them all together ensures they are identical, using the markings on the first one as a guide. He finished cutting out the notches individually. 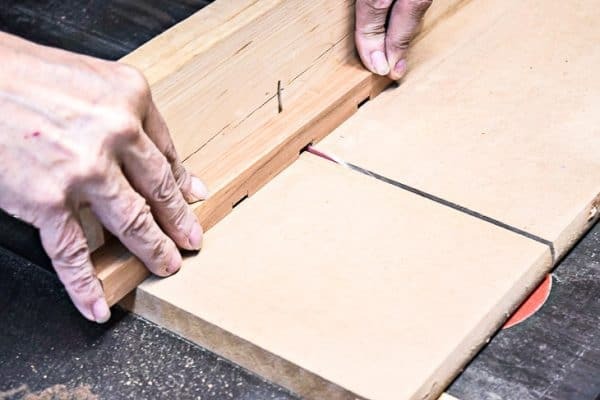 By running the wood back and forth perpendicular to the table saw blade, over progressively higher points on the blade, he was able to get exactly the depth he needed. Next, he showed me how to get a crisp, clean corner in those grooves with his super-sharp chisels. Just a few whacks with a mallet dislodged the excess wood. Now the curved pieces lie flush inside the grooves. This is just a prototype, so they’re not all a perfect fit. But you can see the wall sconce start to take shape. 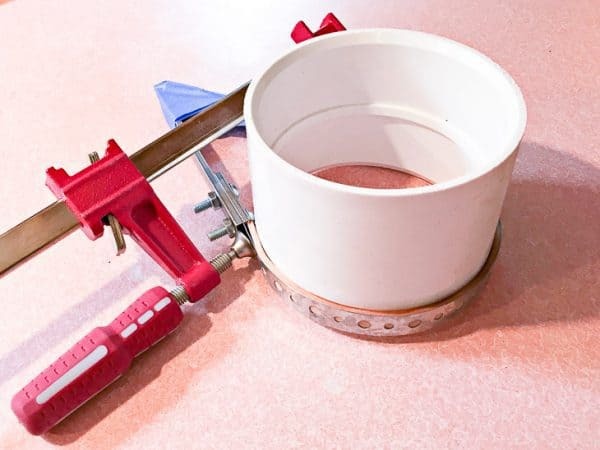 Because the curved pieces for the prototype only stayed on the form overnight, they sprung back a bit when they were released from their prison. It was my job was to trim them to the size of the smallest one to make them uniform. My dad fired up the band saw, and I cut off the excess at his markings. There are no pictures of this step, because I wanted to keep all my fingers intact! 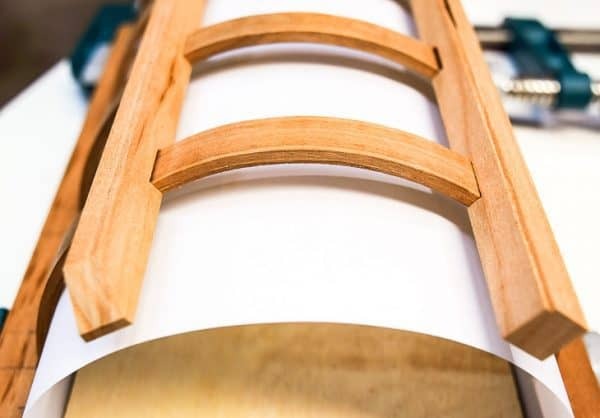 The DIY wall sconce has a plywood backing to hold the light socket and wooden pieces together. We cut a groove in two of the notched pieces to accommodate the plywood panel with the table saw. 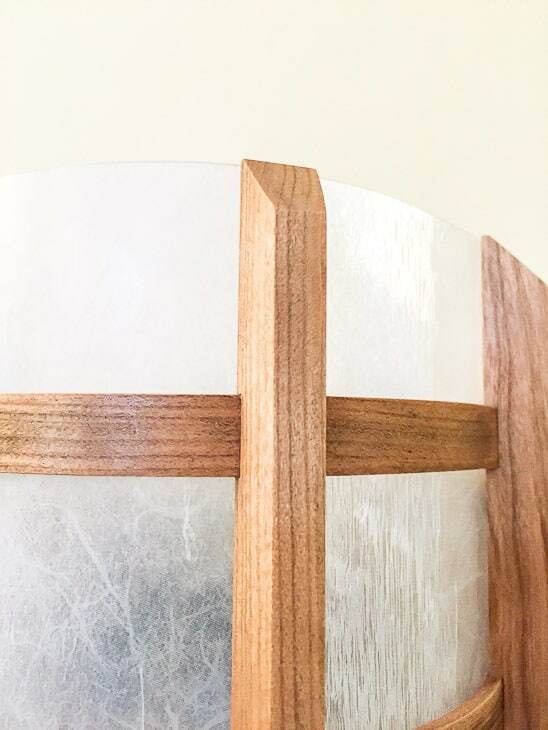 Here you can see how the wall sconce will all fit together when it’s finished. Not too shabby for a prototype! 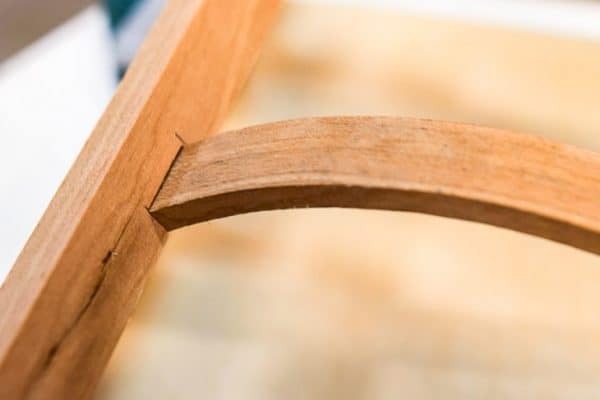 A close up of a joint shows how neatly the arch fits into the notch. We added some vellum paper to the inside to mimic the shade that will be used in the final version. He created the shade with clear, flexible plastic sheets and adhesive window film that resembles rice paper. You can learn how to cut plexiglass here. One reason for putting in the effort to create a prototype is to test out different details without messing up the final project. You can see that the inspiration photo has more vertical slats, but my dad wanted a smaller sconce with fewer pieces. We also tested out a couple different styles for the ends of the slats. We both agreed that the beveled cut was the clear winner! 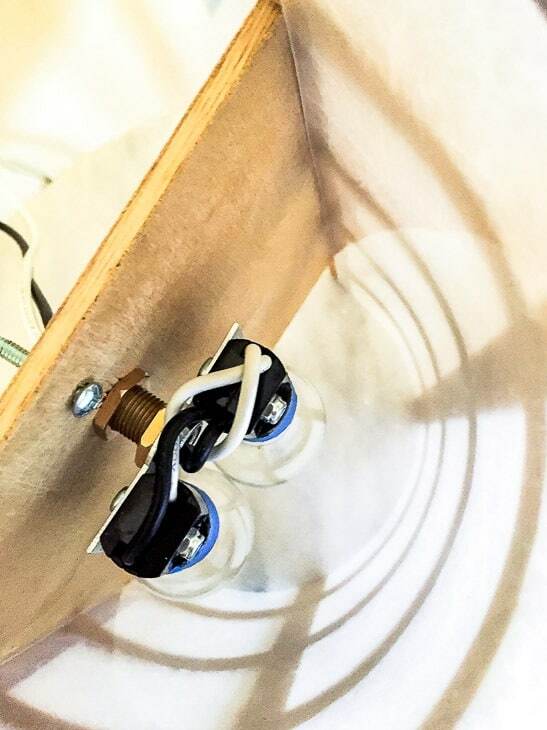 Here you can see how he wired up the DIY wall sconce. Want more ideas for brightening up your home? 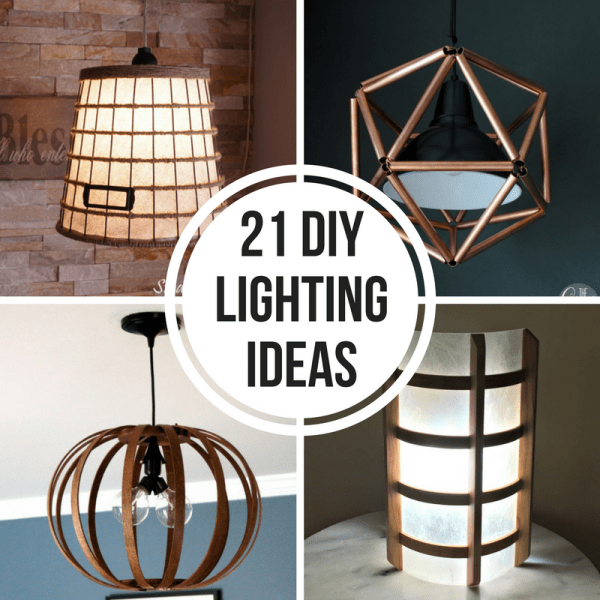 Check out all the DIY lighting ideas I found! If you would like to keep up to date with my latest posts about DIY projects, woodworking and more, you can follow me on Facebook, Pinterest, or Instagram. 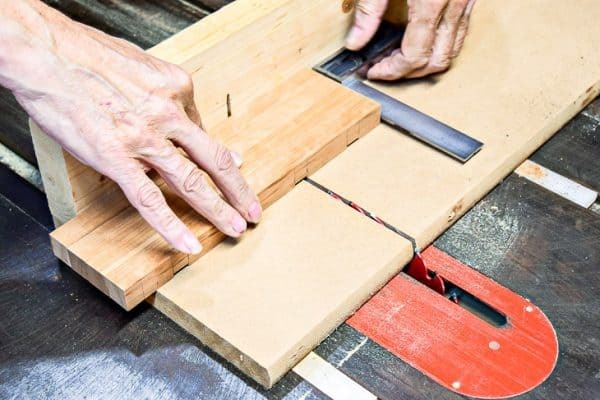 You can also sign up for my email list below and get the latest post delivered to your inbox, plus access to my woodworking plans library! Wow this is lovely!! Great project! My lord you’re talented! This is beautiful!! Wow, you could sell these easily, I guess if you want to make hundreds, that’s how cool it is. I love that your Dad and you could work together on the project. I love it! Thanks Patty! It was great to work with my dad on this project. I just wish we lived closer to each other so we could do it more often! Wow, wow, wow! I have been wanting to try bending some wood and working with new shapes. This is lovely work. I’ll pass this along to my viewers if that is okay! Thanks so much! I’d be honored if you shared it with your viewers! Such a beautiful sconce and I love how completely unique it is! Looks so professional, like you would pay a ton for it in the store. What a great project! I would never have thought to try making something like this on my own, it turned out so well! That is gorgeous. I love this project. Pinning. Thanks for partying with us at Merry Monday. This is a work of art by an artisan. It is definitely over my head but for the many diy ers out there I know you have given them the inspiration and instruction to make it easily. I know my dad will be touched to hear that! Thanks, Debbie! Love this light. Thanks for sharing at the To Grandma’s House We Go DIY, Crafts, Recipes and More Link Party! Hope to see you again this week! Another great project! Thanks for sharing with SYC. I’m sure it’s not intentional, but I’m not seeing a link back to the party in any of your posts. Jann, you can find the page with all the party link backs here. There are way too many to list in each post!